Check out our latest Navajo video dispatch from Monument Valley. It shows the US EPA’s cleanup in full swing. Groundswell correspondent Mary Begay follows US EPA project manager Jason Musante behind the scenes. And creating opportunities to screen the film and for Navajos to tell their story. 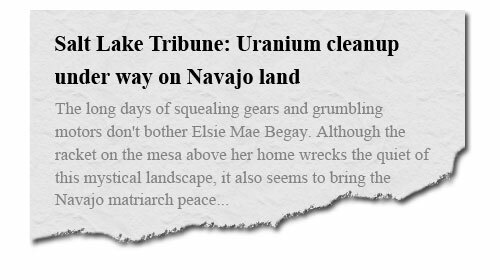 In August, Mary Begay, who shot this webisode, and Jeff Spitz, producer of The Return of Navajo Boy will keynote The Tribal Lands Forum, a national conference for tribal environmental professionals. Their keynote will focus on cross-cultural media, advocacy and environmental justice. Check our website for a listing of other presentations or to book a screening of your own. Order our award-winning film, The Return of Navajo Boy on DVD today! Copyright © 2019 Groundswell Educational Films. Credits. Login. Publicity provided by Amdur Spitz & Associates Chicago Public Relations.